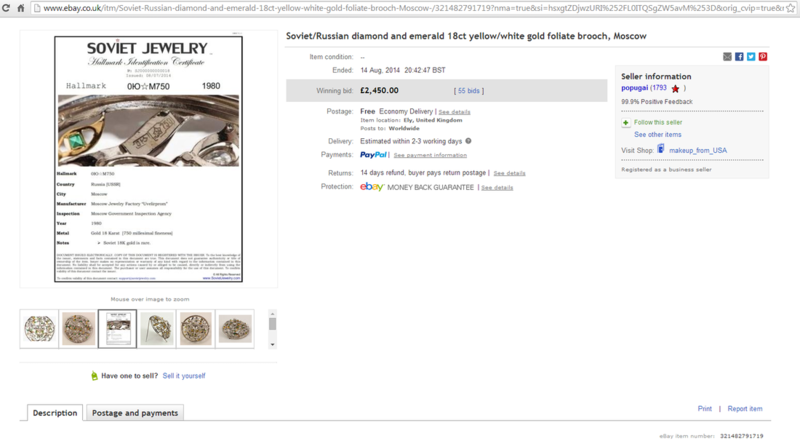 In the screenshots below you can see a Soviet 18K white gold brooch with diamonds and emeralds, for which we issued our Hallmark ID Certificate. 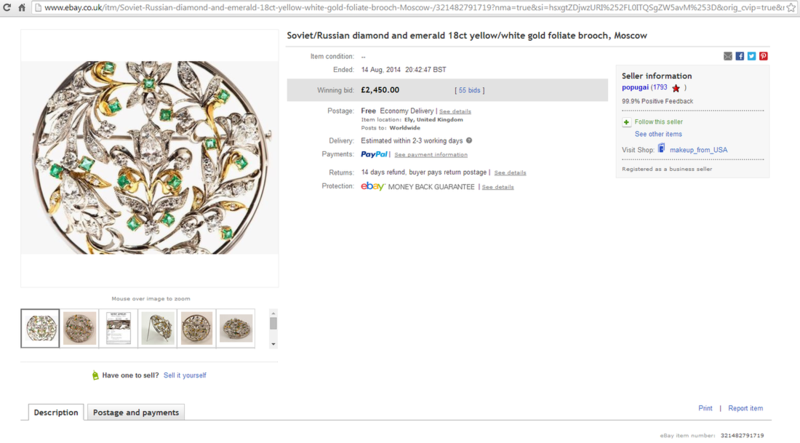 The brooch was sold soon after, on eBay, for 2450 GBP or approximately $4000 USD. We are the first to develop and the only company in the World to offer Hallmark Identification Certificates for Soviet Gold and Silver Jewelry. 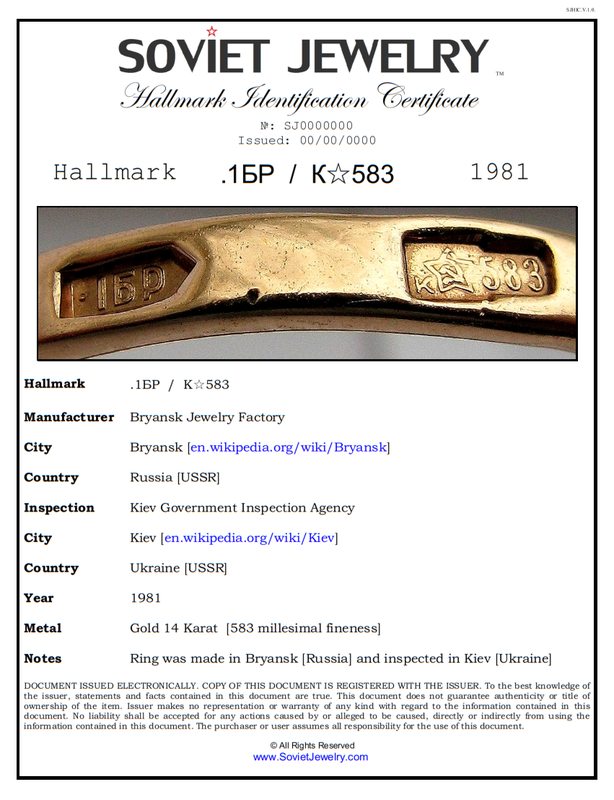 Our experts will identify your Soviet Gold and Silver Jewelry Hallmarks and send you an individually numbered Hallmark Identification Certificate [via email in PDF & PNG format]. A copy of the issued certificate will be stored in our offline database for authenticity and verification purposes. Each request will be treated on an individual basis. To start, please submit a good photograph of your Soviet Jewelry Hallmark for examination. Within 24 hours one of our experts will let you know if it can be identified. If it can, we will send you a PayPal invoice. 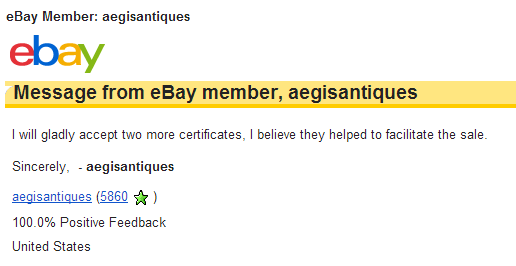 Once your payment is received we will send you the certificate. Our hallmark identification certificates have significantly contributed to safe trading and transparency on the international Soviet jewellery market. By acting as an independent party, with no interest in either purchase or sale of the item for which such a certificate is issued, we are helping buyers and sellers of Soviet gold and silver collectibles to transact quickly, efficiently and with great confidence. The information that this document provides is very useful to collectors and investors. For many buyers knowing that the item is simply Soviet is not enough, most want to know where in USSR it was made, when and by whom, as well as any other relevant information that a hallmark provides. To date, we are the first and only organization on the market to offer such service.